The Europen Space Agency (ESA) keeps publishing articles extolling the Rosetta mission, but has essentially only produced photographs of the duck-shaped body. The bouncing of the Philae lander supplied some useful information on the surprising strength of such a low density material, but the failure to find the little refrigerator-sized object in six months and to determine the elemental composition of 67P is disappointing. 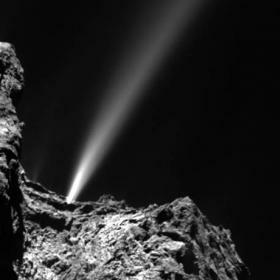 The latest exciting news on the ESA site (Aug. 12) was that the “comet and Rosetta spacecraft cozy up to the Sun” replete with a photo of a single “awesome jet of water and dust” being ejected. Realistically, the ‘comet’s’ perihelion is 1.2458 AU, so its not so ‘cozy’ distance is farther from the Sun than the Earth’s orbit, 1 AU. As a ‘comet’ 67P is a failure. It has never been and will never be visible from the Earth, except through powerful telescopes, even though it is about 30 cubic km in volume. There are only two classes of small bodies zooming through space but their numbers are staggering because they are the result of recent catastrophic events. The rocky and iron meteorites falling today are left over from the terraforming of the Earth between 4000 and 687 BC. The top 20 to 30 km of soil and rock covering the continents of the Earth, the flowering plants and mammalian life were brought to the Earth during that period, while mankind increased and fought, but failed to see the great plan taking place. An uncountable number of bodies from Mars missed the Earth and the Moon and went into orbits around the Sun. Considering the vast size and greater gravitational force of the Sun, infinitely more of these rocks are falling into the Sun every day than fall to Earth. In fact, studies of the absorption spectra of the Sun closely resemble those of meteorites tested in laboratories. What have modern scientists concluded from this finding? They have concluded that the composition of the Sun is very similar to that of the meteorites, and as a result declare that the entire solar system formed from meteorites. But absorption spectra are due to the elements between us and the Sun that are absorbing sunlight and do not have anything to do with the composition of the Sun. The same modern science has spent billions launching half a dozen solar satellites and publishing hundreds of papers trying to figure out why the solar corona (atmosphere) continually exhibits hot spots (now called nanoflares), the momentary temperatures of which reach millions of degrees, while the actual surface of the Sun is only 5000 K. They cannot conceive of the numbers of large rocks falling into the Sun because they believe the solar system has not changed significantly in 4.6 billion years! The second class of bodies zooming around the solar system had never been seen close-up until recently, when the ESA Rosetta probe caught up to what is called ‘comet’ 67P Churyumov–Gerasimenko. The origin of these bodies is completely unknown to modern science for the same reason. The terraforming of the Earth and the creation of Homo Sapiens, was the object of the grandest plan ever conceived and executed by a power far superior to humankind – another concept of which modern science cannot conceive. It began by a body impacting Jupiter and creating the most enormous explosion in the solar system, out of which proto-Venus and the Galilean moons were born. Proto-Venus, then rampaged into the inner solar system, destroyed the ancient reptilian life on Earth, impelled the living planet Mars, (which was in a Venus-like orbit and full of the life forms we now enjoy and still had its solid iron core (Mercury) at that date) close to the Earth, then continued to control Mars orbits of the Earth in order to completely exhaust Mars’ life resources (soil, rocks, oceans, atmosphere, flora and fauna) to the Earth (terraforming), and finally removed all three of the bodies, described in the Bible as “sinning angels” involved in this 3,000 year plan, Mercury (the former solid iron core of Mars), Venus, and Mars to tartarus, places of restraint, i.e. their current orbits 687 BC. A huge class of bodies like 67P are by-products of this great plan, and given the wisdom of the creator cannot be completely discounted. The enormous explosion out of which proto-Venus rebounded began a continous fusion burning in the crater on the solid, heavily deuterated, Methane Gas Hydrate surface of Jupiter. This originally sent a flaming plume two million km into space (mythologically called Zeus’ aegis and Marttanda in the Rg Veda) that slowly declined over more than five thousand years and is presently manifested as the Great Red Spot. As the gas in the plume expanded and cooled it froze into low density, porous bodies of various compositions, many of which, traveling at similar speeds collided (splatted) and stuck together. These bodies have been described in many posts on this site that predate Rosetta. This is exactly the form of 67P, manyo f which (>million) comprise the main belt asteroids. Based on the composition of the newly created proto-Venus, which is still far too hot for its crustal elements and water, floating in the inner solar system, to settle on its surface, Jupiter comprises the full complement of heavy elements in the abundances known on Earth, therefore 67P will have the same composition. As if to prove that his grand plan is flawless, our God caused the great impact on Jupiter at 22 ° South Latitude. Over the last 6,000 years this has resulted in many millions of 67P-like dark (30 km³) asteroids all having significant inclinations (the main asteroid belt and Kuiper belt included), therefore arcing invisibly below and above the plane of the solar system, keeping Earth safe from their impacts. But SOHO and STEREO solar satellites have spotted some 2,000 of these shy creatures crashing into the Sun since 1995, and there are many more lined up in the same orbit, which is not currently explained. To their credit, modern science has actually detected the remnants of the explosion on Jupiter 6,000 years ago, but hundreds of previously unemployed astrophysicists have declared that this radiation is proof of the Big Bang, proclaiming the evolutionist academia view that ‘science is God’. 1 Cor 3:18-19 Let no one deceive himself. If anyone among you thinks that he is wise in this age, let him become a fool that he may become wise. For the wisdom of this world is folly with God. For it is written, “He catches the wise in their craftiness,” and again, “The Lord knows the thoughts of the wise, that they are futile. Therefore let no man glory in men” So let no one boast in men. ~ by Angiras on August 27, 2015.